Once a private eye always a private eye? That may be true of Raymond Chandler, who coined the term in 1938, when he was still writing short stories and a year before the publication of his first novel. It’s a problem for his detective, though. Chandler died in 1959, and for the early part of Marlowe’s career he was about fifteen years younger than his creator until he reached a point where Chandler decided that he would be thirty-eight forever. That suited the other authors the Chandler Estate chose to continue Marlowe’s novelistic adventures (Robert B Parker and Benjamin Black aka John Banville) but the latest to write “A Philip Marlowe Novel” as this book is subtitled in the USA and “A Philip Marlowe Thriller” as his British editors have it, Lawrence Osborne (who has decided that Marlowe will age). This is still retrospective fiction – the year is 1988 and Marlowe is 72 – but Marlowe is much more a man of his years, and loss of suppleness. Marlowe has retired to Mexico (a Royal wedding has drawn attention to elderly men retiring to Mexico recently) but Mexico thirty years ago was a different place to the Mexico of today. It was different again from the Mexico to which Marlowe helped Terry Lennox escape in 1950, in The Long Good-Bye. Drug smuggling is already an enormous trade but it seems the atrocious cartels are not yet on the scene, and anyway, when two insurance executives approach Marlowe they are looking for help with a life insurance claim on a guy who drowned while yachting off the Baja California coast. Where there is a suspicious death, though, there is a detective, and soon enough it is Marlowe. A wealthy property developer has popped into the bay to moor for the night – come the morning his yacht has moved on and a body with his ID is found drowned on the beach. Tracking the widow to another town Marlowe finds she has little interest in her late spouse, though like many women he comes across, Marlowe finds her interesting enough. The fisherman who discovered the body, found a second ID in a pocket; but the owner of that ID has disappeared. Unless that is, his is the body on the sand and the yacht owner has stolen his identity. A man such as Marlowe is interested in learning such things; though the Mexican police are not, and the fisherman knows he should not disturb them with evidence of potential wrongdoing. Let’s stop the story at that point, about a third of the way through, because we are going to get a lot more Mexican geography, a bit of research north of the border, but not a lot more plot. Marlowe shows the spy-craft he has developed: he has an electronic bug and knows how to use it, and the walking cane that supports him doubles as a sword-stick in a fight, but having discovered the distinction Lawrence Osborne’s publishers have made between a “novel” and a “thriller” I would say that “novel” is a better description. This is a novel, a rumination by Marlowe as his powers fade. This is not another Big Sleep or Little Sister, not even another Black-Eyed Blonde (Benjamin Black’s effort); you need to find another author if you want one of those, but if you want something closer to a detective’s meditation on his own “long good-bye” (along with bugging and sword-sticking, admittedly) you may find it in Only To Sleep. 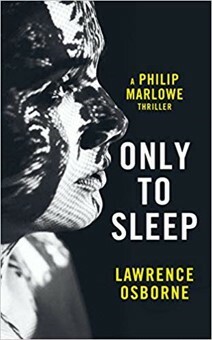 The attention that this new title has been given, might have meant you missed July’s publication of The Annotated Big Sleep, edited by Owen Hill, Pamela Jackson and Anthony Rizzuto (Black Lizard), a nearly five hundred page effort that tries to put everything that Chandler tried to do, and succeeded in doing, into some form of context. Of course, you could go to your bookseller and order both. And Like Marlowe, I’ll drink to that.